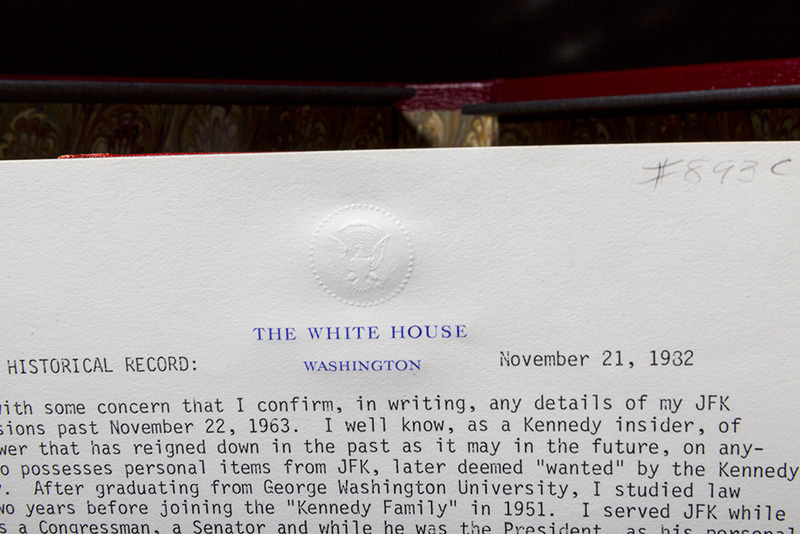 Octavo, 129pp. 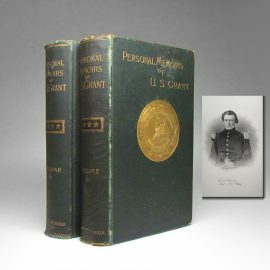 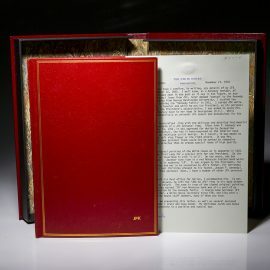 Full red morocco, title in gilt on spine, initials “JPK” in gilt on front cover. 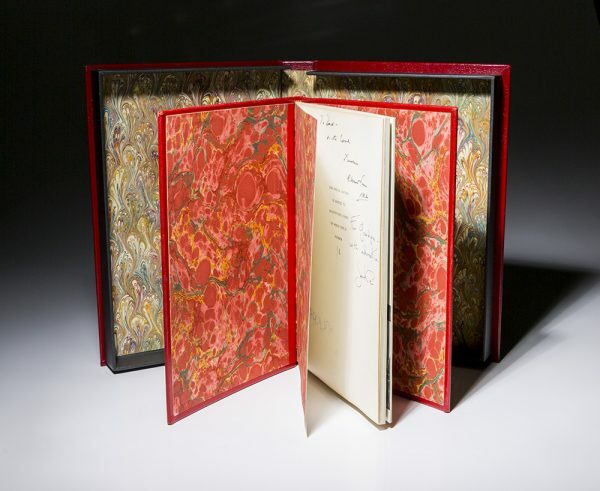 Marbled endpapers. 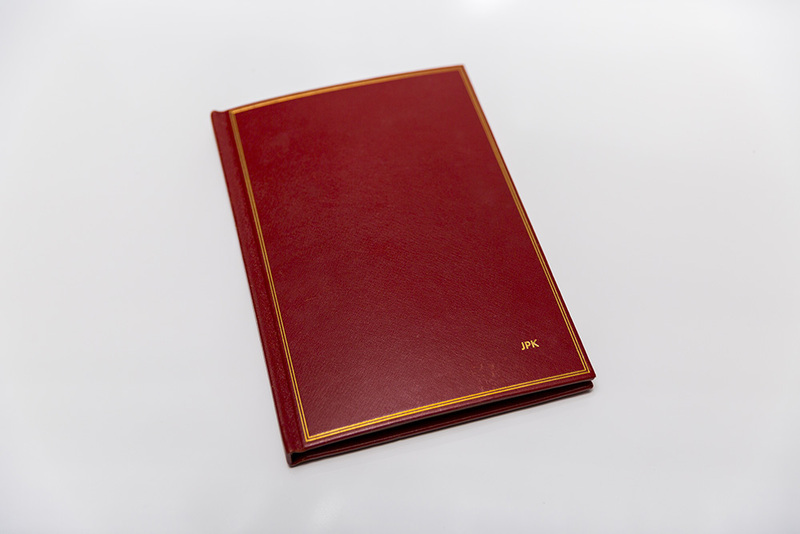 Slight bowing of covers, not affecting spine or text. 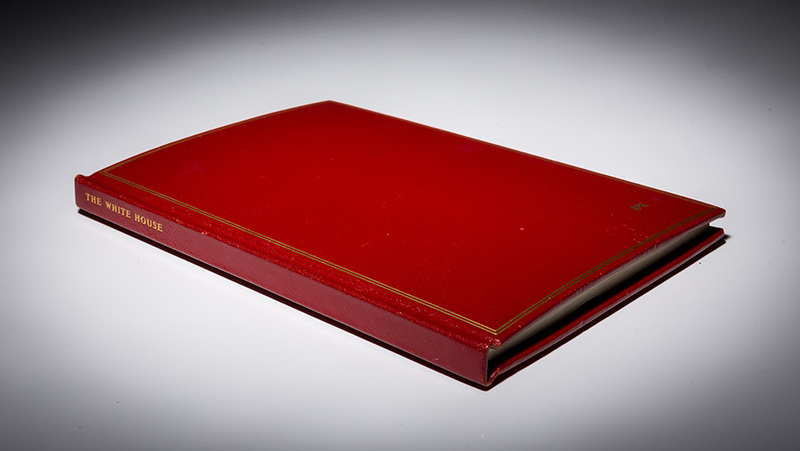 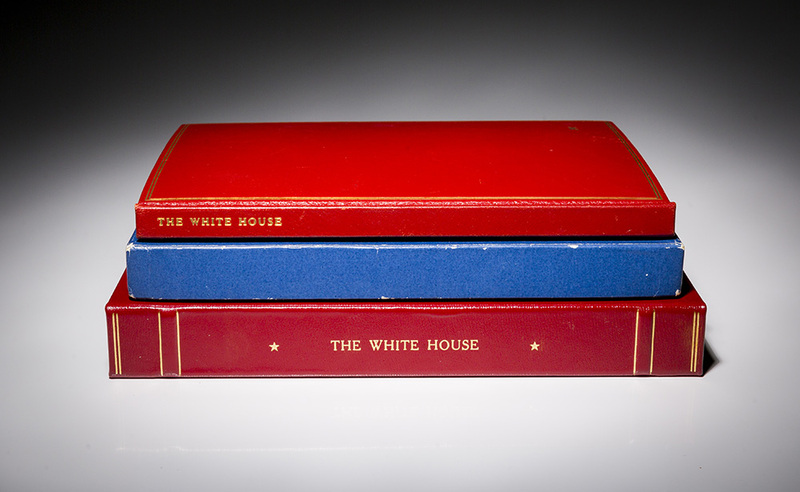 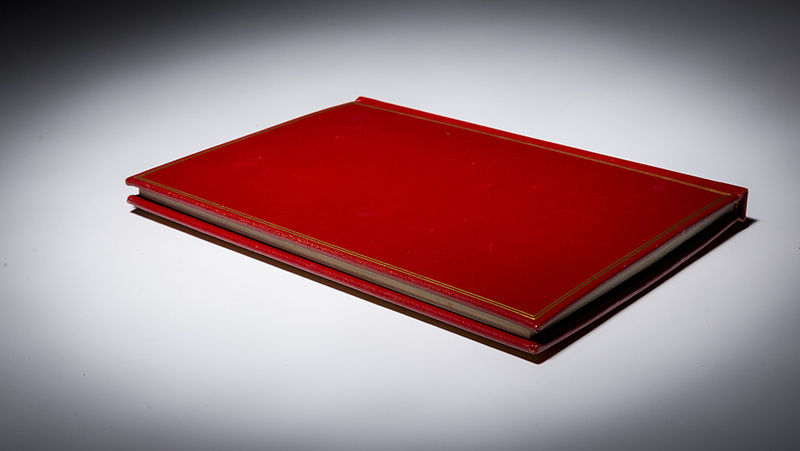 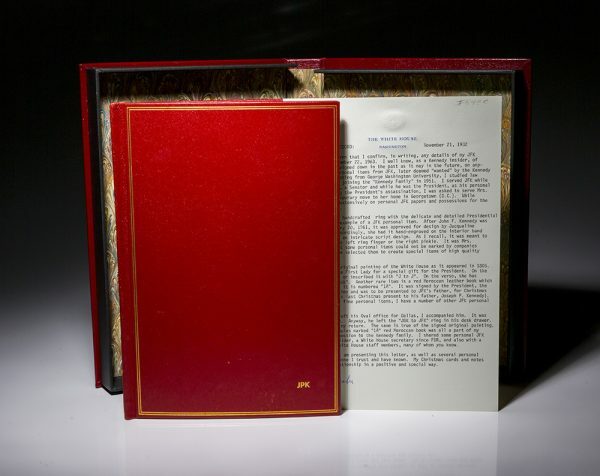 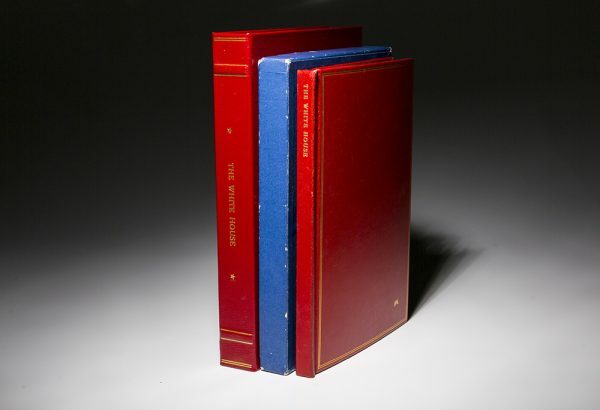 Housed in custom made red leather clamshell case, raided bands, title in gilt on spine. 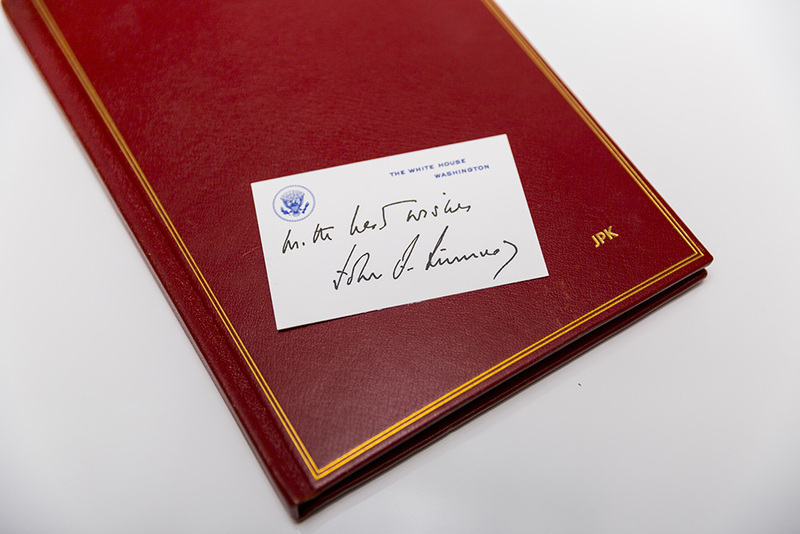 From a limited edition of 75 copies, this is number “1A,” inscribed for Joe Kennedy, Sr. (father of President John F. Kennedy). 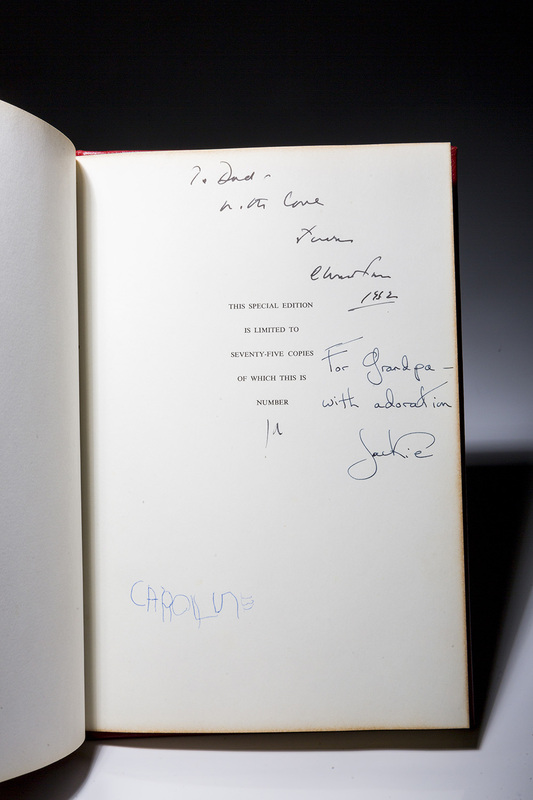 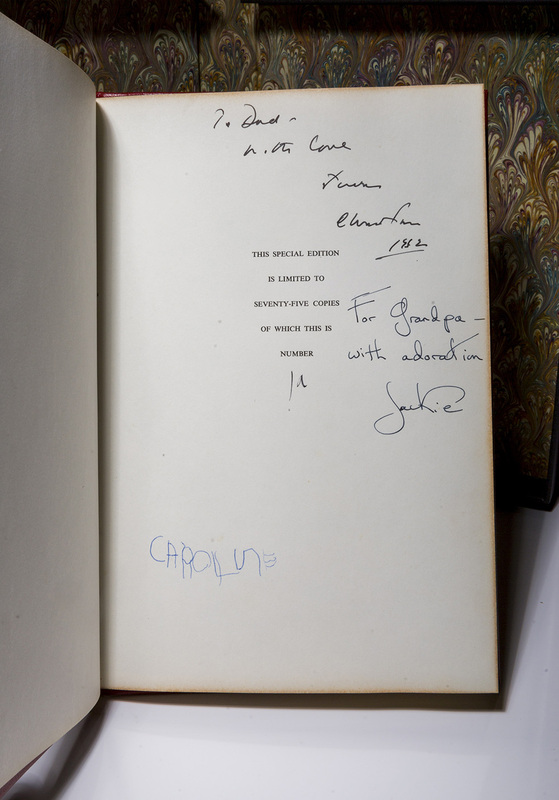 Signatures read: “To Dad – with Love, Jack, Christmas 1962.” From Jackie Kennedy: “For Grandpa – with adoration, Jackie.” and signed by 5-year old “Caroline” near bottom. 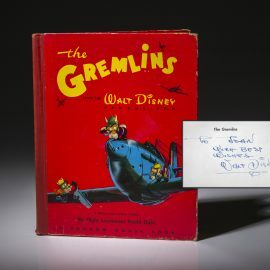 An incredible piece of history. 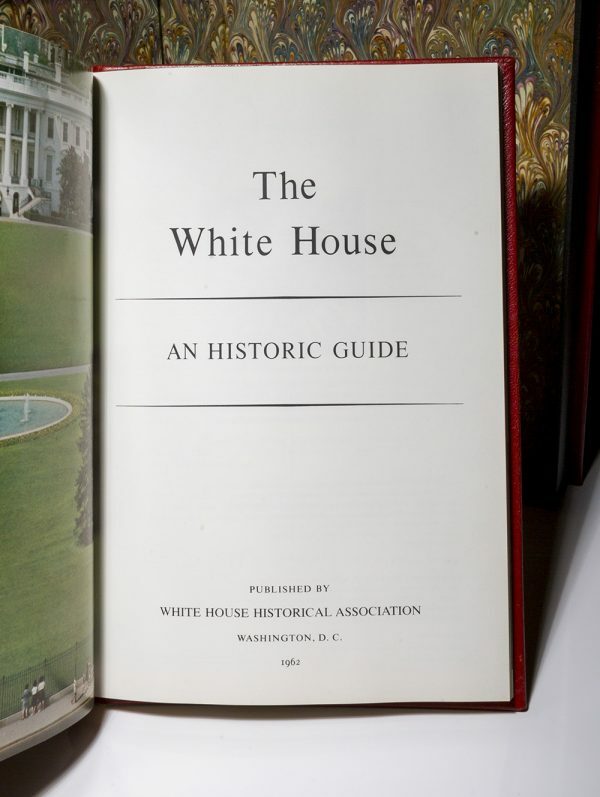 Comments: This book comes from the collection of Evelyn Lincoln, personal secretary for John Kennedy from 1953-1963. 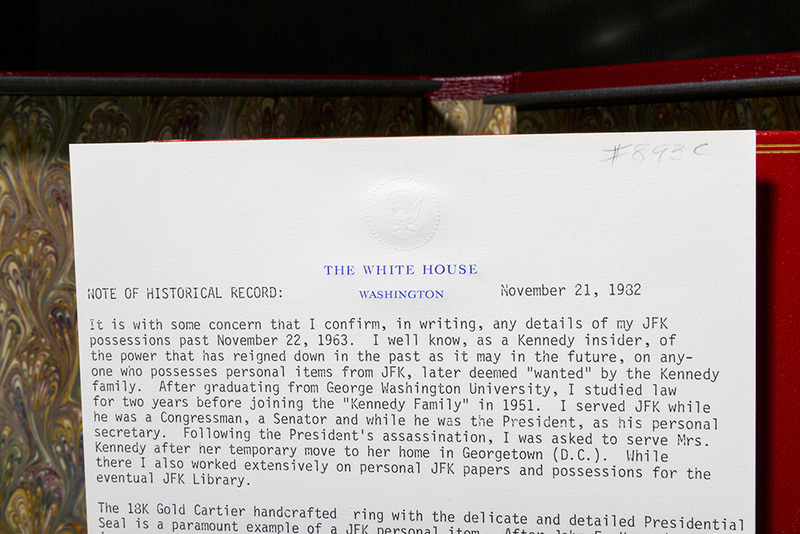 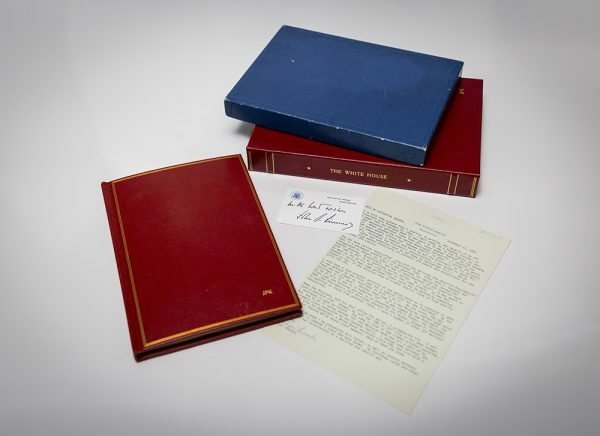 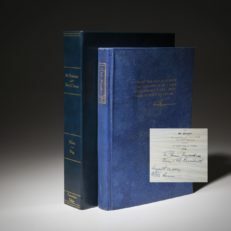 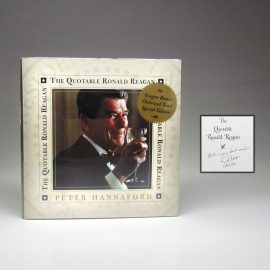 The letter of provenance associated with this item describes how the book was given to Joe P. Kennedy for Christmas in 1962, “the President’s last Christmas present to his father.” After the assassination of John Kennedy in 1963, Evelyn Lincoln collected these items from President Kennedy’s desk, when she returned from Dallas. 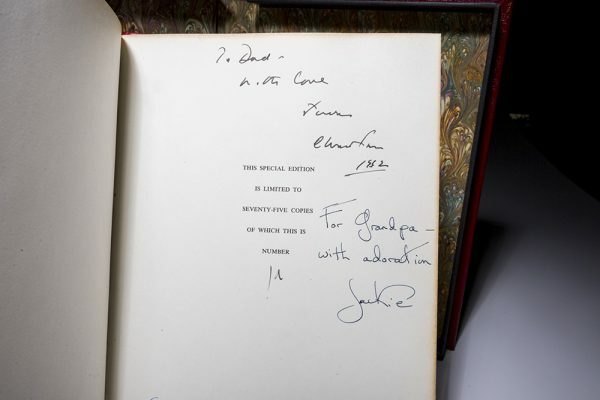 It is not known why the book never made it to Joe Kennedy, but it can be assumed that since he suffered a stroke in 1961, he was unable to attend the Christmas Party where the gifts were distributed. 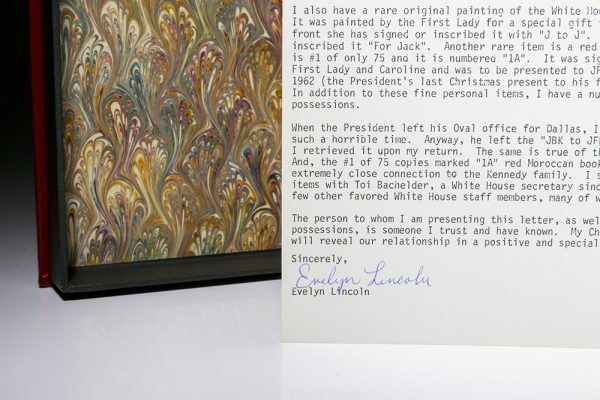 Includes the following: Letter of Provenance signed by Evelyn Lincoln on White House stationary, original blue cardboard box, plastic protective wrap. 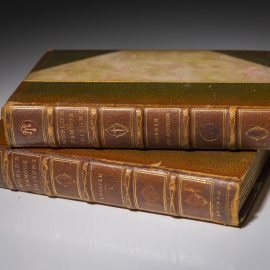 The First Edition offers collectors the finest selection of important rare books. 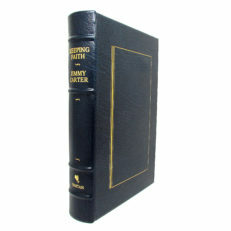 Browse through our inventory, discuss a specific book or consign your inventory.